LONG BEACH, Calif. — High freight levels, decreased productivity and the driver shortage have contributed to tightened capacity, and carriers and intermodal providers said they are focusing on efficiency to meet supply chain demands. “We have to get more capacity out of the infrastructure, investments and equipment that we already have,” said Spencer Frazier, senior vice president of sales for J.B. Hunt Transport Services. 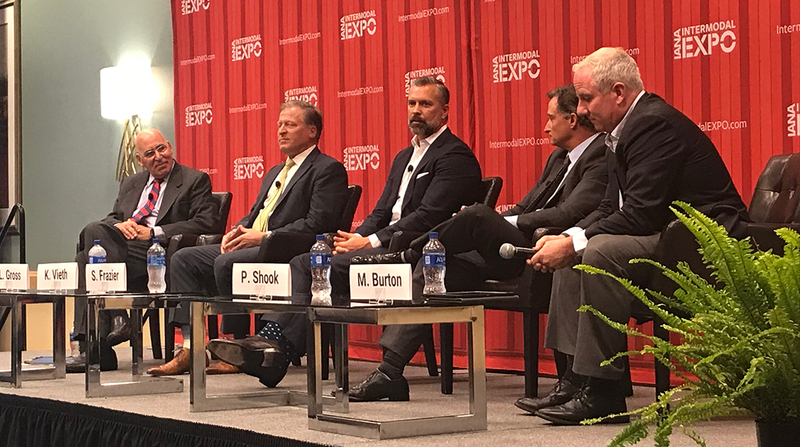 Frazier was one of several panelists who spoke on capacity during the Intermodal Association of North America’s Intermodal Expo 2018. Larry Gross, president of Gross Transportation Consulting, was the panel moderator. Jim Filter, general manager of intermodal at Schneider and an attendee at the event, told Transport Topics drivers are facing congestion at the terminals, and the company has invested in technology, including an app that lets drivers schedule terminal times, to improve productivity. “The faster you can clear the yards, the faster you’re going to improve their velocity,” Filter said. Schneider, which is based in Green Bay, Wis., ranks No. 7 on the Transport Topics Top 100 list of the largest for-hire carriers in North America. Mike Burton, president of C&K Trucking, based in Chicago Ridge, Ill., said any productivity improvements would help capacity. He added that the electronic logging device mandate and increased data has changed shippers’ mindset. “Now they’re having those conversations and talking about productivity, which helps,” he said. Conversations are taking place from the C-level to the dock door, Frazier said. “Everyone’s awareness of the capacity constraint on cost and service levels is elevated to something we haven’t seen before,” he said. C.H. Robinson, based in Eden Prairie, Minn., and No. 4 on the Transport Topics Top 50 list of the largest logistics companies in North America, tracks the amount of time it takes for drivers to get in and out of a facility, and Shook said shippers are investing in driver amenities and on-site parking. “The drivers have their pick of what freight they’re going to haul. They don’t want to go places where they don’t have Wi-Fi, restrooms and comforts,” he said. Schneider’s drivers can rate shippers’ locations via Schneider’s app. “They’re able to provide a numbering system and then a free form on why they could say if it was a good location or bad." “We share it with our customers but also make decisions on what freight we want to accept and how we approach it in the bid,” Filter said, adding that if shippers don’t treat drivers well, they’ll send drivers somewhere else." J.B. Hunt, which is based in Lowell, Ark., and ranks No. 4 on the for-hire TT100, is sharing qualitative and quantitative data with customers, such as loading times and the driver’s experience. Burton said driver challenges are greater for the drayage community. “The complexity we have the industry doesn’t have is we’re tied to productivity outside of our control — rail yards, port and chassis,” he said. C&K Trucking sees greater driver recruitment retention issues in areas with productivity issues. Schneider added 4,000 containers this year to help address capacity constraints, but Filter said the company hasn’t made additional capital plans yet. “We see the rails are slower right now, so they’re consuming containers. As we go through and get past the surge seasons, we’ll have a greater sense of velocity how many containers we need,” he said. Kenny Vieth, president of Columbus, Ind.-based ACT Research Co., said sales of Class 8 trucks have increased significantly. Since 2011, sales have averaged 265,000 units per year for the North American market. “In the last three months, orders have been booked at a 700,000-unit annualized rate,” he said.